If you are going to change the oil in the forks anyway,,, I would highly suggest getting a set of Progressive springs and installing them at the same time. I did this a few weeks ago, and the difference in the ride in amazing. It will be another $90 or so, but you'll already have the tubes opened up anyway, if you are replacing the oil. As stated above, you can change the weight (15# instead of 10#) but don't change the amount. You'll increase the likelihood of blowing a seal. And unless you take them completely off the bike, you won't be able to get ALL of the oil out. I bought a small hand pump, and pumped the oil out into a container, marked how much, then replaced the same amount with the new oil. You will also need the specialty tool for the left side (if you remove the springs). Good luck,,,, and let us know how it went. Dartanuan, thank you. I thought about it. Do you know what the model number is? I am pretty good with a wrench. retired now.= 58 years of wrenching. Last edited by chuck_VTX F; 11-28-2018 at 06:34 PM. try to put your front tire between tho solid objects...like a lawnmower and a car. put my first piston in my Kawasaki f7 175 at age 14.
bicycles were never much of a challenge!!!. ever rebuild a 3 speed rear hub on a bicycle... ? I wish I had this photo.. in 1962.. I have/had NO father, or relatives. I thought myself.. from library books. Last edited by chuck_VTX F; 11-29-2018 at 05:20 AM. [QUOTE=Irod2;4566888]Dartanuan, thank you. I thought about it. Do you know what the model number is? Progressive offers two options. Their stock springs for the 1800's and Gold Wing springs, which vary slightly in length. I went with the stock set --- 11-1520. They are normally $97 for the set, but I found them for around $80 on sale on one of the sites. Hope this helps. I had one of those, a Hercules 3 speed twist-grip shifter. Had it apart numerous times, but never 'rebuilt' one. That twist shifter was as fast as an automatic- I could whip any bike with a Derailleur gear system. If you have a lift, get the bike up and see how loose the front feels. There should be some light resistance in the steering. 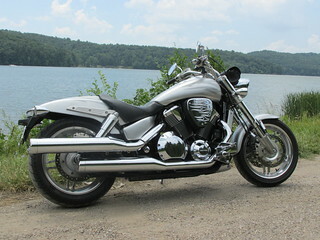 I had my 2007 VTX 1800T steering bearing re-torqued to specification and the bike only had 10K miles on it at the time. When my steering was loose, I could hear a clunk when I hit small pot holes or road bumps. Thank you guys!! I will look at the progressive springs for when i change the fork oil. Yesterday, it felt even looser. I got home, put the bike on the lift, did not feel any movement front to back or anything (at least not that I could feel), the steering had no resistance, it would not stay put anywhere, it will move side to side if you blew next to it. Remove the top of the triple tree, and with my hand undid the nut holding the bearing and the top nut with the washer as well, all come together. Front end dropped. I realized it might have been too loose. I put the bearing back in place, lifted the front (from the fender) to be able to screw the nut again. And did it per the video on bareass, by hand, and added a little extra afterwards. I tested it on the street it seemed ok, will have to do my normal trip to see if it made a difference. 1. wwould the nut normally be unscrewed by hand, that easy? 2. how can i be sure i sat everything right, since i was holding the front end from the fender, all the way so I could screw the nut back in place? Is there an angle I need to make sure the front end is at? Thank you all for the help this far. It has been appreciated.